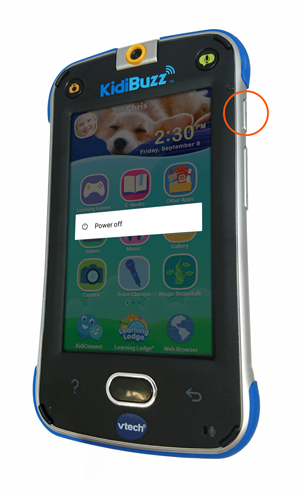 How do I reset the KidiBuzz™ to factory settings? 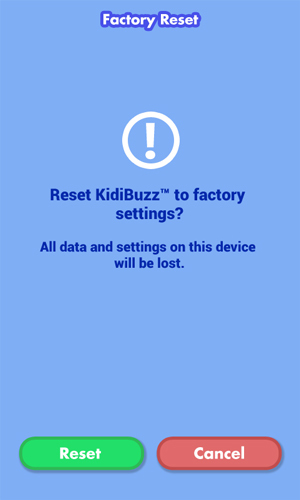 Follow these steps to reset your KidiBuzz™ to factory settings. Warning: Any data saved in internal memory will be lost. Data saved on an SD memory card (not included) will not be affected by resetting the device. You can back-up your photos, videos, and music to a computer with the included USB cable. First, turn off the unit by holding down the power button for 3 seconds, and then touching the on-screen "Power off" pop-up window. Once the system is off, press and hold the HELP button, HOME button, VOLUME DOWN (minus) button and the POWER button at the same time. When the white VTech screen appears, release only the POWER button. Continue pressing the HELP button, HOME button and the VOLUME DOWN (minus) button until you see the Factory Reset screen. If the Factory Reset screen does not appear, repeat the steps above. You may need to repeat these steps multiple times. TIP: Unplug the power supply first if it is difficult to turn the device on in charging mode. Once you see the Factory Reset screen, release the HELP button, HOME button and the VOLUME DOWN (minus) button. If your power source is unplugged, plug it in to the device. Then, touch "Reset" to continue. 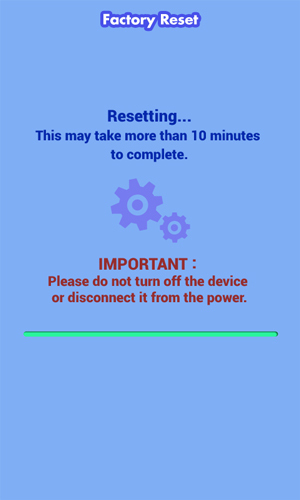 Do not turn off the device or disconnect the power source during the reset process. A screen will appear to show the progress. The reset may take more than 10 minutes to complete. The device will restart once the reset finishes. You will see a black screen for a few seconds. When the device turns back on, the reset process is complete.